As the US begs for a deal with the Taliban, Russia also hosted a day-long summit on Feb. 5 between a Taliban delegation and Afghan politicians, including former President Hamid Karzai, although no representatives from President Ashraf Ghani’s administration were present. The US engaged both Syria and Iran when it was bleeding from an insurgency in Iraq back in 2005, it has used a similar approach in Afghanistan after bleeding for 17 years. The US has enlisted the help of all the nations surrounding Afghanistan – Pakistan, Iran, India, China and Russia. Since the death of Mula Umar the Taliban has splintered and a number of leadership changes. This has seen some factions reach out to Iran as well as Russia. The US-Taliban talks do not involve the Afghan government, it would seem this has been outsourced to Russia. The British army operated rules of engagement in Iraq and Afghanistan that at times allowed soldiers to shoot unarmed civilians who were suspected of keeping them under surveillance, a Middle East Eye investigation has established. The casualties included a number of children and teenage boys, according to several former soldiers interviewed by MEE. Two former infantrymen allege that they and their fellow soldiers serving in southern Iraq were at one point told that they had permission to shoot anyone seen holding a mobile telephone, carrying a shovel, or acting in any way suspiciously. A former Royal Marine says that one of his officers confessed to his men that he had been responsible for the fatal shooting of an Afghan boy, aged around eight, after the child’s father carried his body to the entrance of their forward operating base and demanded an explanation. The US invented the concept of signature strikes, which established drone strikes on any target considered a threat, which included 4 people, travelling in a jeep or doing jumping jacks. It would seem the West follow the principle of killing enough people in the hope they’ll catch someone of importance. US President Donald Trump said military intervention in Venezuela is “an option” as Western nations boost pressure on Nicolas Maduro to step down. Meanwhile, Russia has warned against “destructive meddling”. Venezuela who possesses the world’s largest oil reserves has been in chaos for some time now and as the country was a poster child for leftist movement around the world these movements and nations that supported Venezuela are falling over themselves to protect the interests they have with the nation. US hawk and national Security advisor John Bolton admitted on a Fox TV interview “We’re in conversation with major American companies now…It would make a difference if we could have American companies produce the oil in Venezuela. 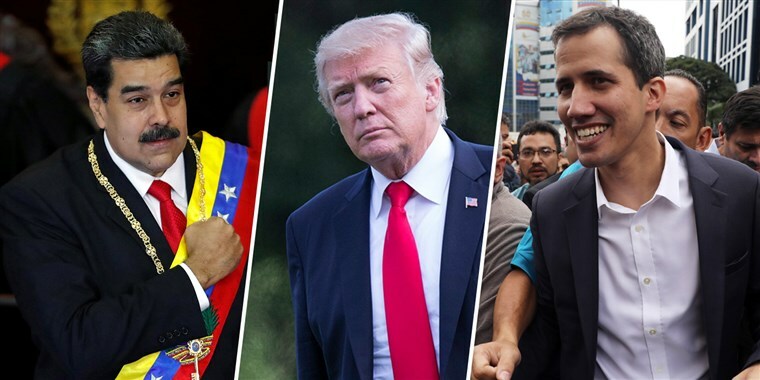 It would be good for Venezuela and the people of the United States,” the US has placed sanctions on Venezuela’s government and supported the opposition leader, who recently and unilaterally called himself the new ruler of Venezuela – Juan Guaidó. The US has historically meddled in the affairs of most Latin American nations ad considers the continent its backyard.